I possess something that’s priceless. Not everybody has it and it can’t be found in books or downloaded from the web…it’s IMAGINATION. Knowing that I have it isn’t enough. Imagination can be a fickle thing. If I don’t take care of it, it will wither. I must nurture it, feed it, stimulate and exercised it or like any muscle it becomes weak. I also know technology robs me of it (cell phones, computer, T.V…). During Lent I abstained from technology during the day (12pm-5pm). I am amazed how much my artwork has flourished during these weeks! I wasn’t much of a student when I was in school. In fact I would have rather been anywhere else besides a classroom. Why? School was hard for me. My sisters did great in school. They did their homework, took tests and got good grades. They made it look so easy! I did my homework, freaked out during tests and got dismal grades. I was trying! Some nights I’d spend hours upon hours studying, memorizing…with no improved results. Eventually I came to the conclusion I lacked intelligence which made me feel ashamed. I wish I knew then, what I know now. I’m not dumb (far from it). But I do learn differently. I’ve made allowances for my way of learning. I am a visual learner which means I need to see things repeatedly, read aloud and write things down. The very thing that was my downfall in school is my strength today. I’m a visual person. I see things that most people miss and I also see how they could be different. In my studio I live in the world of what ifs? 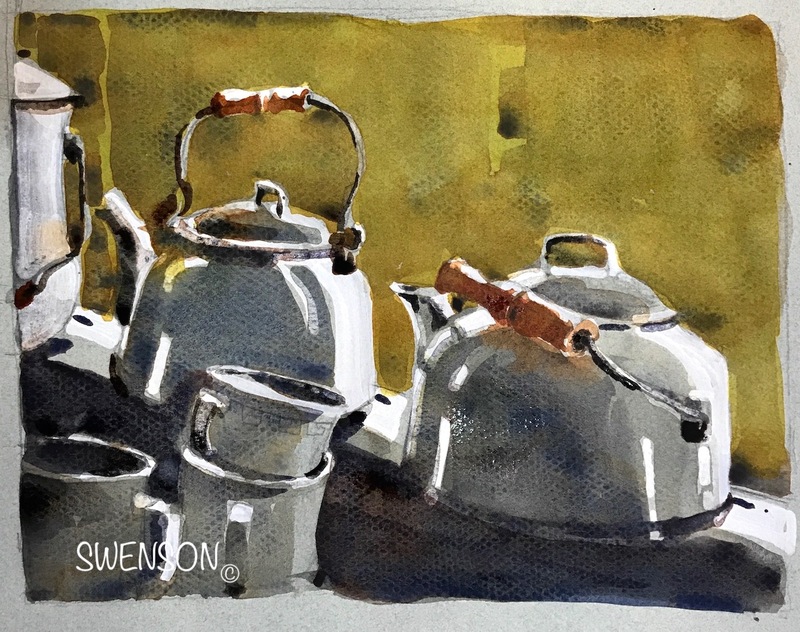 I like to imagine different ways of sketching and painting light. I am always pushing the boundaries of what I know. My experiments may fail but they may also succeed. The excitement of pursuing what I don’t fully understand is stimulating! The presence of light is the most elusive and exciting subject I know. I’m always looking for ways to interpret it. 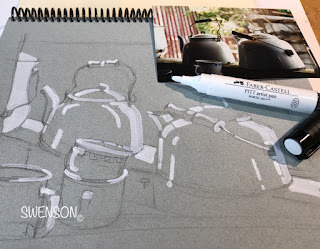 1. continued by painting on the gray paper. I used a gray pastel paper by Canson called Mi-Teintes. Working on a toned paper I have no whites so I used a white marker for the whites. The marker is a Faber-Castell, Pitt White 101. Now don’t go getting all purest on me here and say white is a NO, NO! I’m exploring here…NO RULES. I am not worrying about a transparent watercolor show. The next step I used watercolor. The marker was watercolor proof so it didn't bleed when paint touched the edges. around the lights without using any kind of resist, masking fluid or tapes to save the lights. You can read earlier posts on negative painting here. 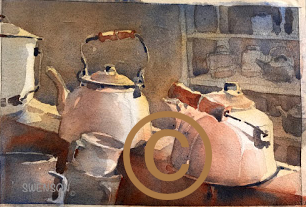 I used a limited palette of Quinacridone Burnt Orange, French Ultramarine, Raw Sienna Light and Lunar Black, by Daniel Smith Watercolors. A few years after Mike and I we’re married he made a comment about how smart I was. At first I thought he was joking…but he meant it. He was the smartest person I knew and I trusted him. It took me a while to fully understand the depth of what he meant. I possess imagination. Hi Brenda! I love it! Yours was one of the first blog posts I've read talking about imagination! Such an important attribute to have as an artist! I liked your examples too! Thanks! Peggy, Thank you! I appreciate your positive words. Imagination and observation are the greatest tools we have. They can take us anywhere. Thanks for taking me on your journey today. Thanks for your thoughtful comment and insight. Hope to see you one day! I think imagination is born from observation. Only when you've totally observed and understand something can you go beyond the obvious. Love your watercolors and drawings!!!! Jan, Good point. Sounds like you've been painting a while. Diane, Thank you for your kind and thoughtful words! I've always struggled to learn but never shared it before. It's good to share... Now others who feel the same way won't feel so alone. The "what if" approach to life is an important concept to model. My sister, an amazing elementary school teacher, told me that that is what all schools are missing when they eliminate the arts from the curriculum. If those of us who live happily in the "what if" realm are not in the classroom then many students will not have exposure to this vital component of creativity. Like many things, this can be taught and modeled by those who are hard-wired to operate this way. Art was the only subject that kept me interested in school...WE NEED IT BACK! I, too, am a visual learner. Thank you so much for verbalizing why I felt for years that I wasn't intelligent. My grades might not have been the best, but I loved observing people, cars and their changing styles, nature, etc. I think that seeing as an artist should be promoted in our schools instead of lopping off the funding for "frivolous learning". Our world can only benefit from our budding artists - no matter what their field - creativity is what makes our world go round. I love your observations and the talent you have nurtured thru the years (and years). Thank you for sharing your thoughts and paintings with us!! Boy do I relate to learning differently! I had tears every night while trying to learn the times tables, but took immediately to geometry & Algebra. This reminds me of my other favorite quote by Albert: "Everybody is a genius. But if you judge a fish by its ability to climb a tree, it will live its whole life believing that it is stupid." I tend to think inside-out about a lot of things. 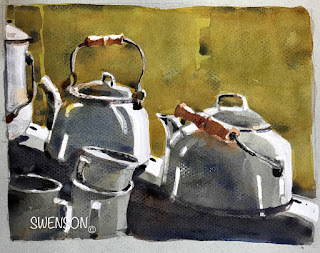 I love this tea kettle painting! Kellsey, I love that quote and I'd never heard it before. Thank you for sharing... it's a keeper!!!! Wow! What a great article and it is SO good to know that so many others have faced life with the same feelings you addressed, and that we can share and know we aren't alone! I remember feeling "left out" during school, but one art teachers positive comment about my work got me through and I remember her to this day. I just wish I had the strength then that I have now to persevere. I didn't work on my art for years and continued thinking I was different. Thank you to Kellsey and her quote by Albert Einstein! Continue thinking outside the box everybody! Oh man, you put this so clearly, thank you! Just over 30 years ago (hard to believe it was that far away) when it was an odd thing to do, I decided to home school my 2 boys. My husband was against it, but I went to talk to the school superintendent anyway. He told me that home schooling was a good idea! He said, "Schools teach kids so they'll do well on tests. It makes parents happy and the schools look good. Schooling them at home, you can teach them how to think for themselves." And imaginative people are curious. We sometimes take it for granted that everyone else is curious too, but most people just aren't. Great comment...thank you! I've done demos a museums and had bus loads of kids come through. I could always tell where I was talking to a child who was home schooled. They were articulate, knew how to ask thoughtful questions, genuinely curious and so much more! You did the right thing for your boys. Way to go!!! What a clear, beautiful description about varied/multiple intelligences. I think we're getting better at seeing and appreciating these astonishing and varied gifts earlier, the strength in the different ways of learning. I worked hard as a teacher to recognize, affirm, and learn from my students about specialized ways of learning, to point out to them the rare beauty in what I was seeing and ask them what they were noticing about how they did those things. As an artist, I've learned to observe differently by following your descriptions and demonstrations of negative painting over the years. This post opened things up further. Thank you so much for taking time to share your gift and to describe how you work, how you see. Thank you for your input! It's nice to hear when I've made a difference for someone....BIG HUG! I agree, we're getting better at recognizing different ways of learning earlier. Unfortunately knowing isn't always enough... teachers in public schools need more help in the classroom, smaller classes and creative arts back in the curriculum. We've got a long ways to go. Schools outside of America do value the arts and recognize at least 7 styles of learning. Schools in the States are influenced by business and try to bring those practises into the school environment. I could go on about this... As a retired teacher, I see a huge change in kids. In the 1990's, before technology was so prevalent, kids' handwriting and artwork was very imaginative. In the last 15 years or so, I see more and more kids unable to formulate a sentence, let alone an imaginative story. They also have stilted, unimaginative artwork. The influence of Manga has also affected their artwork. As a substitute teacher, I constantly encourage the use of their imaginations. It's an uphill battle. I love your art, Brenda, and am so glad you found your niche! Sizzy, Thank you for your kind and thoughtful words. Brenda, always such a delight to read your blogs. You definitely ARE smart and an exceptional artist. Happy belated birthday! Patsy, Thank you for your kind words and friendship from afar. ~Hugs! Another great post, Brenda...so inspiring!